I should have been all over this story more than a week ago when it was first reported in The Examiner, San Francisco's ultimate source of truthiness in journalism. (Intrepid blogger Doc Haagen Dazs beat me to it). But, there are really two stories to tell here and I have been too swamped at work to write this and to figure out how to make the two stories work together in one blog post. The first and most important story, of course, is the one that lets me thump my chest and say, "Ahah, I told you so!" You may recall that about a year ago, in a ground-breaking post so long and so long-winded that it required its own intermission, I rambled on about what the future of long-distance travel might be if fuel prices continued to rise. I came to the unlikely conclusion that travellers of the future might actually return to crossing oceans the way that oceans were crossed for centuries - in sailing ships. And, ironically, was there something useful and practical after all in those preposterous boats at Valencia? Will carbon fiber multihulls and high-tech solid wing sails be the technology we'll need for long-distance travel when the pump finally runs dry? Ahem, where was I? Oh yeah, that article in The Examiner last week. Well, it seems someone is proposing to the San Francisco Port Authority that the key to slashing costs for San Francisco Bay ferry service is to switch to high-tech sailing catamarans, with solid wings modeled after the one used on Larry Ellison's AC 33 boat. Once again, with wisdom bordering on clairvoyance, O Dock was right on the money! The Examiner doesn't make much out of the fact that the guy promoting the idea operates one of the more popular catamaran charter fleets on the bay and so just might be trying to drum up more business for his other enterprise. They also don't dwell on how the numbers would crunch, either. The boats would still have conventional diesel engines for lots of practical reasons that scheduled ferry service requires. So, they would probably be a lot more expensive to build and maintain than regular ferry boats. And The Examiner seems to be just accepting the promoter's number of an estimated 40 per cent annual savings in fuel costs. The initial tests will be run from Sausalito to the city, straight across the Bay's windiest strait - the famous or infamous 'slot' (famous or infamous depending on the cajones of the sailor). Ferry runs in other, less windy, parts of the Bay might not benefit from fuel savings nearly as great. Too, the promoter is counting on getting federal money from the EPA to fund the prototype and we know how easy it is to get money out of Washington today, unless you're an impoverished banker or auto company CEO. But it is still neat to think there's even an outside chance of being able to catch the 8:10 am boat over to the city for your morning commute - on a boat that is actually sailing. I wonder if there will be discounted ticket rates if you're willing to grind winches or just be rail meat. But, hold the phone, I said there were TWO stories here. What's the other one? There's something of a clue in that Examiner clip in the photo above, but you'll just have to wait until after intermission to find out. Ah, how was the popcorn? You may have noticed, in the clip from the Examiner above, the photo they used to illustrate the story. 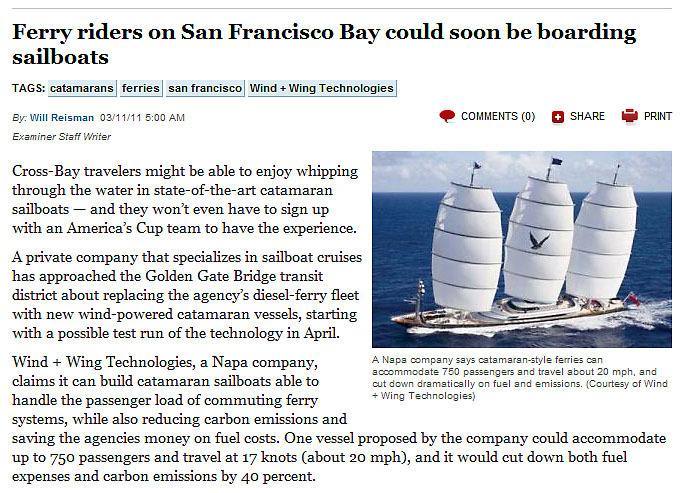 "A Napa company says catamaran-style ferries can accomodate 750 passengers and travel about 20 mph..."
So, since The Examiner is San Francisco's ultimate source for truthiness in journalism, that must be a photo of a sail-powered catamaran ferry boat, right? And, if you know anything about San Francisco sailing, you'll recognize right away that the boat is Maltese Falcon - the biggest, baddest, ballsiest wonder or monstrosity ever to sail the Bay - depending on your point of view. No matter what you think of it, though, for better or worse, that boat has probably gotten more international attention than any other Bay boat in the past 25 years, except maybe for Ellison's AC-winning trimaran, which has never sailed here and may not ever. 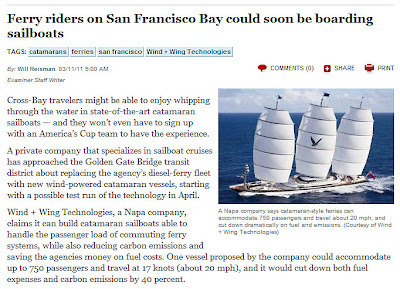 So, you'd think that over at San Francisco's ultimate source for truthiness in journalism someone would have noticed that the photo of Maltese Falcon had nothing to do with the story about catamaran ferry boats. How could the leading mainstream rag in a sailing town like SF make such a goof? Well, my personal theory is that Max doesn't work there anymore. In days of yore, every newspaper had some old guy named Max on the copy desk. Max's job was to know everything about everything. Max knew the difference between lie, lay, laid, and lain. Max knew when to use 'which' and when to use 'that'. Max knew all of the amendments to the US constitution and why they were amended. Without googling. Max knew who JFK's Secretary of State was. And who JFK's poet laureate was. So, when the young, green kid, fresh out of school, grabbed the first photo of a sailboat he could find to slap on the page next to the story about the sailing ferry boats, Max would have been watching. From his desk across the way, Max would pretend not to be watching, but Max was always watching. "Yo kid," Max would have said, "are we doing another story about Maltese Falcon? Didn't we just run that photo last week?" "And can't you find a photo that's got something to do with the story - one that isn't going to make us look like a bunch of dopes?" Max even remembered what the Maltese Falcon was named for. Some of us will miss Max a lot (not alot). Besides, a sailboat is a sailboat, right? Who's going to know the difference? Two weeks ago, as everyone else in the newsroom was informed that Max had regretfully decided he needed to spend more quality time with his family, Max was called into a small office that used to be called 'Personnel' when Max started but that is now more efficiently called 'Human Resources'. Max was handed an unmarked manilla envelope by a nicely groomed young lady whom he had never met, and, after 32 years of keeping the newspaper from looking like a bunch of dopes, was quietly laid off. Or, is it layed off? We need more Max's in our news media. BTW it reminded me of a friend who used to work for the BBC technical group, who had a call just like that go the HR to receive an envelope containing a cheque from a nice young lady. In fact she was so nice they are now married! Cynics of course would state that she spotted a nice young man with a fat cheque in his pocket, but they have no music in the soul. Though they probably still have jobs. As to a comment actually about what your post was about, alas I must now go and get back to work. There's a moral or two here somewhere. I was actually thinking this week of writing a post for Carol Anne's culinary writing competition about how food shaped the culture of a region and I had the perfect newspaper article from the British Daily Mail newspaper to illustrate it and then I started noticing all the mistakes and historical howlers and statistical blunders in the article and I thought I would use it anyway and see if anyone else noticed what I did but after reading this excellent post I think Max must have been laid off at the Daily Mail too but then on second thoughts I don't think the Daily Mail ever had a Max and by the way you know I really wouldn't mind if you did a post about popcorn once a week or so. Holy crap that reminded me of the Brielle drive-in when my brother and I saw Love Story with my parents starring Ryan O'Neal and Ali MacGraw and we were in our pajamas playing on the playground they had there for kids who were bored by the movies that their parents wanted to watch. BTW, the use of the photo in that article is just plain weak. I bet that wouldn't have happened at that venerable Sacramento publication. JP, as you might have guessed, Max is a fictional compilation of a lot of Maxes and Maxines I've known over the years whose empty chairs now haunt me as I walk through a newsroom that's a much quieter place than it used to be. The worst transgressions seem to be in the online version of the paper where the pressure to publish immediately is greater and fewer eyes check what is released. There's also the temptation to print now and check later, since what goes online can be changed or removed - a luxury not available in print. Breaking news stories will often be updated five or six times in the course of a news cycle. Sometimes, I think the content of online newspapers is no more reliable than Wikipedia. Tillerman, why don't they call the online version the Daily e-Mail? And either Max or Carol Anne (if she happens by) will probably be lecturing you about run-on sentences. I could have used Max's help myself in this post. Extra credit to anyone who can spot the historical error I've made (at least, the one I know about). Baydog, at first I thought you meant the intermission reminded you of that old drive-in, but then I realized this post must have bored you as much as old Ali McGraw movies. That's OK, though. Blogging means never having to say you're sorry. In answer to your question, O Docker, The Poet Laureate was not officially created until 1985. Robert Frost read at JFK's inauguration, but was not titled as such. JFK didn't have a poet laureate. US poet laureates are not appointed by the president. The Poet Laureate Consultant in Poetry to the Library of Congress (to give the post its correct title) is appointed annually by the Librarian of the United States Congress. In making the appointment, the Librarian consults with former appointees, the current laureate and other distinguished personalities in the field. At least that's what it says in Wikipedia which is almost as reliable as the San Francisco Examiner. Mojo is right too. Prior to 1986 the post was called Consultant in Poetry to the Library of Congress. Tillerman, your answer must have crossed with Mojo's, but Max would probably go with Mojo's version, anyway. In a newspaper, shorter is better (one of the reasons I would never make it as a newspaper writer). That's what I love about blogging, though - the stuff you learn. For all of these years, I've thought Frost was JFK's poet laureate - a pretty common misconception, apparently. The official Library or Congress site About the Position of Poet Laureate seems to suggest that the informal title of US Poet Laureate was used since 1937 to refer to the holders of both posts referred to in my previous comment. So Robert Frost was the US poet laureate in 1958/59 but interestingly enough not at the time of JFK's inauguration. And here's another interesting historical footnote. Frost wrote an original poem for the inauguration, but could not read it in the blinding sunlight, so recited another poem from memory. See here. Here's a link to the text of the poem, which, for some reason, I wasn't able to find at the msnbc site. ... and it was the archivist (of the JFK Library) who opened the package with the "lost" poem. Do we know any archivists? I must admit that from a literary perspective, I much prefer The Gift Outright (the poem he actually read), to the Dedication poem. A turbulence he had the better of." Mojo, I think I agree that I like the earlier poem better. And it looks like, again, a torch is being passed to a new generation. ... and have no idea where Philadelphia is?? ... not to mention Independence Hall? But they've probably heard of Pat's. WV: delyshir... yes, we're talkin' cheese steak! Mojo ... I can tell you which of my students know 1776, Philadelphia, and Independence Hall: the immigrants. How ironic that so many people who are born here don't know the history and philosophy that make so many people who aren't born here want to come here. Did I ever tell you that my name is on the Liberty Bell? Funny how that question always kills the conversation dead! maxes and maxineses . . . we need you not only in news medias but also in governmentses at all levels. nice post! Tillerman, I don't think it was your comment. Almost any mention of Philadelphia will do that. Tugster, thanks for dropping by. You're right - today, the second estate is in as much trouble as the fourth. Or, is an elected governing body in the third estate? Where is Max when you need him? Speaking of that iconic Philadelphia shrine, rumor has it that arnold has submitted a provocative article to Foreign Affairs entitled "for whom the liberty bell toll?" It's an essay on freedom in the word today, from a Blattarian perspective. Apparently, though, the "Max" replacement at Foreign Affairs is struggling with arnold's unconventional punctuation. Max would've looked at the third paragraph and said "So, where's the other guy?" Via Pat Byrnes's Facebook page. Bonnie, I had to reread that story about three times to figure it out, too. I think the unaccounted for guy is the woman mentioned two graphs lower down in the story. Confusing editing at best. You're right, Max would not have been happy. But it's a good example of the kind of work copy editors do. I think we've all written stuff that seemed perfectly clear to us, only to discover it can be read in an entirely different light. Horrible accident, though. I wonder what kind of 25-foot sailboat it was that they had managed to load 10 people onto. Mojo, I've been struggling with more than just arnold's punctuation, lately. He's discovered Amazon and has been ordering candy bars online. Of course, he bills then to my credit card. Do you know what next day shipping costs for a candybar? Actually I will be serious now - Pat has now posted a lot more information on Desert Sea. He's making an educated guess that the boat was something like a MacGregor 25 or 26, and he's owned one of those, taught safety classes & done some loading/overloading experiments under controlled conditions. Has got what sound like some very plausible theories about what happened. One source (NBC San Diego) says it was indeed a MacGregor 25, operated by a company from outside of San Diego, perhaps doing a special needs ride. "Harbor police say a non-profit company operated “Nessie”. “It was a voyage, or a tour if you will, operated by this non-profit entity, which is not from San Diego. The operator of the vessel is from Southern California by Laguna. The vessel is registered to a company out of Indiana,” said [San Diego Harbor Police Chief John] Bolduc." One other theory besides failure to crank the ballasted centerboard down would be complete failure of centerboard attachment and total loss of ballast; that would have been catastrophic in a heavily loaded boat with inexperienced sailors. I really hope the special needs thing is wrong. For what it's worth, I was able to access some AP photos of the boat at work. The boat has been dismasted and there is an ominous looking gouge at the water line, which may have been caused by the dismasting, or could be the result of a collision - it looks like it was done by something heavy that scraped along the boat. The boat has New Jersey registration stickers and the home port of Tom's River is painted on the transom. It looks like it wasn't in very good condition even before this happened. It's hard to believe a commercial rental company would have chartered something in this condition. Hard to tell from the photos, but it looks like there's no centerboard or retracting keel extended from the bottom. I don't know Macgregors very well, but I think it's one of the older ones - it's definitely not one of the later ones designed to use a large outboard. It has a fairly new looking Honda 8-hp on the transom.